This magnificent palace was built by Maharaja Nripendranarayan in c.1887 AD following the plan and design of the classical European style. The double storied brick building is raised on a basement of 1.5 m in height. 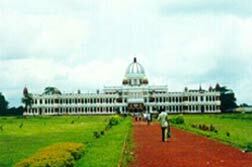 The facade of the palace is embellished with a range of arcade on both ground and first floors. The Durbar Hall, with its gilded dome above, is the main attraction of the palace. A site museum has been organised in the restored palace. Popularly it was believed that this is the ruin of the palace of the Khen rulers datable to c.14th-15th century AD. 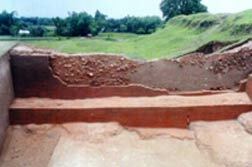 Recent excavation carried by the Archaeological Survey of India has revealed structural and antiquarian remains belonging to c.10th-11th century onwards. A substantial mound much higher than the surrounding plain. Some sculptures of the Khen period (c.14th - 15th century) are lying at the mound.